Bloch, born in Germany, came to the United States at the age of 5. His family settled in North Philadelphia, and Bloch first studied at the Philadelphia Museum School, where he excelled in draftsmanship. He later studied at the Pennsylvania Academy of the Fine Arts with Daniel Garber, Cecilia Beaux, Henry McCarter, and Thomas Anschutz. The portraits of Thomas Eakins also had a strong influence on his work. While a student, Bloch won the coveted Cresson and Toppan awards. Bloch was drafted for service in the First World War, and fought in Europe. 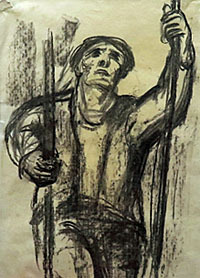 In the 1930s he received commissions from the W.P.A., and Eleanor Roosevelt chose one of his paintings, The Young Worker, for display in the White House. 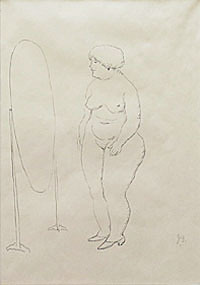 The Corcoran Gallery bought another, The Striker, for its permanent collection. Bloch, who was especially known for his depiction of African-American subjects, taught portraiture for many years at the Pennsylvania Academy of the Fine Arts. He has an extensive exhibition record and was awarded numerous prizes in exhibitions at the Whitney Museum of American Art, Corcoran Gallery, Museum of Modern Art, and the Pennsylvania Academy of the Fine Arts. Listed: E. Bénézit, Dictionnaire Critique et Documentaire des Peintres, Sculpteurs, Dessinateurs et Graveurs, Gründ, Paris, 1999. Who Was Who in American Art, Peter Hastings Falk, editor, Sound View Press, Madison, CT, 1999.